"A little known band which made one single and a tremendous album. Their album consisted of nine standard length, blues based hard rock songs, similar to rural sounding loud rockin' bands like Reaction and Incredible Hog. Part of the album was recorded live. The great treasure of this album is the mean and growling guitar sound, with the fuzz effects exaggerated to the extreme!" 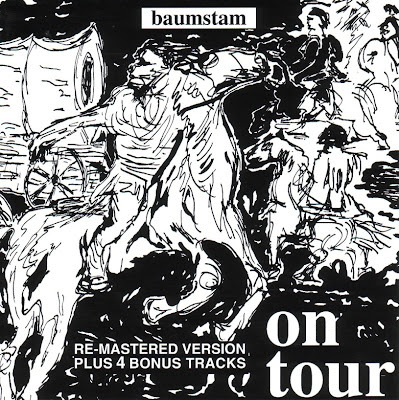 "Baumstam = Tree Trunk (for those interested). These were an obscure heavy blues-rock band, but with little individual identity, nor any real Krautrock touches, being much more English styled. Their privately issued album is sought after in collectors circles due to its scarcity, more than for its musical content. Despite what Dag Erik Asbjornsen says about these - which seems to describe a completely different album - in his book "Cosmic Dreams At Play", we weren't impressed, as ON TOUR sounds much like an average late-1960's British hard-rock album. In 2004, Ulrich, Volker and Gerhardt reformed the band, with new members: Adi and Anna, and have apparently made the new album."